This photo was taken on December 26, 2015 at 6:23 AM. The location was in a very nice upscale hotel in Washington DC. The "Take It!" came from how well this presentation of holiday Egg-Nog was set up in the lobby. Everything possible was polished chrome. The stand was unusual and a perfect fit for the tray. 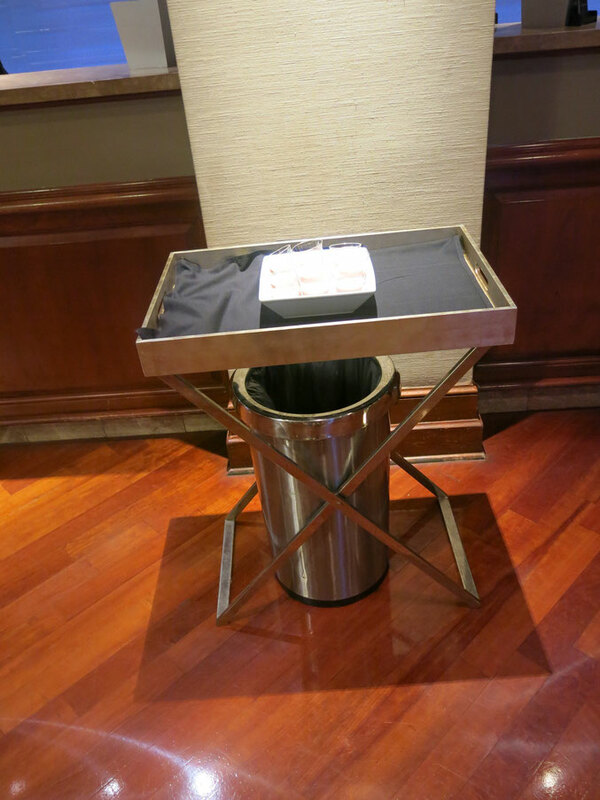 The waste receptical was placed on center under the tray, with just the right amount of separation between it and the bottom of the tray to provide easy access when tossing the empty cup into it. The beverage looked freshly poured and ready to be enjoyed. The After Take: This looked like a great sample of a combination that could be used for a similar purpose almost anywhere. The metal tray was light (possibly, polished aluminum) and with its hand grips on either side, looked like it could be used as a part of a Breakfast in Bed serving arrangement. It is often said "eye appeal is half the meal," this rings true for many beverages as well. Here is hoping your Holidays included lots of cheer. Must have been a pretty nice hotel to offer anything other than water. Egg Nog is always one of my favorite parts of the holidays, love the stuff. Never could stand the stuff, nice of them to offer though!